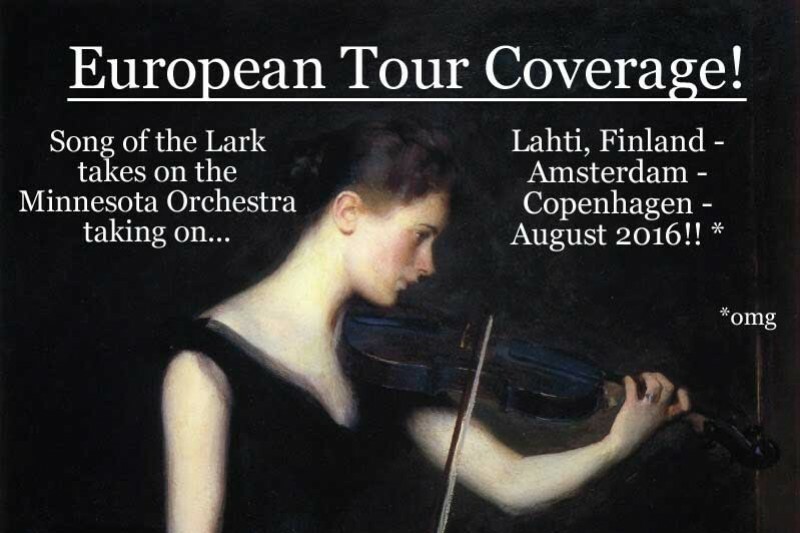 Fundraiser by Emily E Hogstad : Song of the Lark European Coverage! Song of the Lark European Coverage! I'm following the Minnesota Orchestra on its 2016 European tour, going to its shows in Lahti, Amsterdam, and Copenhagen! I'll be traveling from August 18 to August 30, taking the same flights as the orchestra and staying in the same hotels, to guarantee an up-close-and-personal perspective. Every step of the way, I intend to bring the European tour experience to my readers using words, pictures, videos, and social media. I know how many people want to go on this tour to celebrate the resurrection of their orchestra, but can't. So I want to bring all the excitement to you as a way of saying thank-you for all you've done for this magnificent ensemble. If you want to help, toss a few bills in the hat and accept my SINCEREST thanks! Guys, I'm so excited and thrilled and honored to be doing this. I really, really, REALLY hope you enjoy, and I'll catch you on the road! You go and have fun now!